The Ponte Vecchio ("Old Bridge") is one of the great symbols of Florence and one of the most famous bridges in the entire world, where tourists pass through observing the shop windows of the jewelry stores and couples seal their love with a promise. 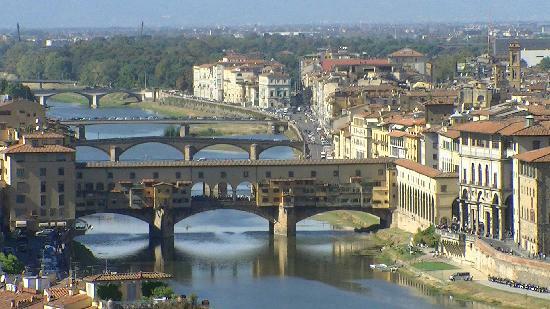 The Ponte Vecchio is one of five bridges that cross the river Arno. The oldest of them all. 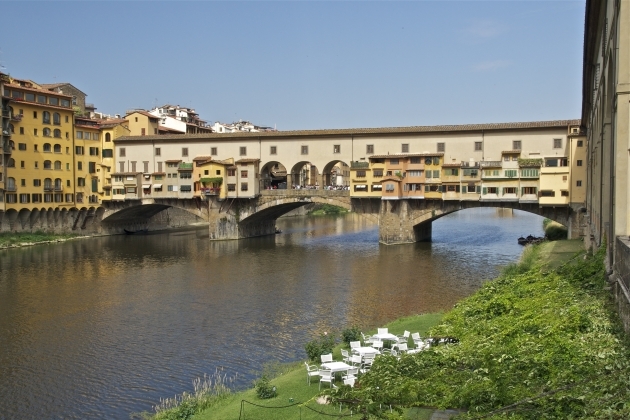 But the Ponte Vecchio is also the symbol of Florent Apartments. It is for this reason that we have decided to inaugurate our blog covering the history of the Ponte Vecchio. 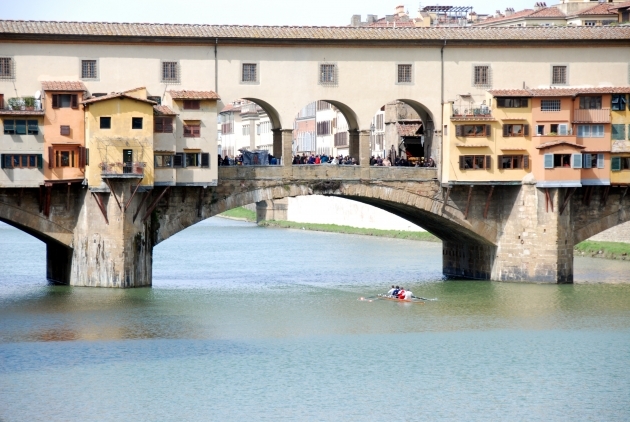 The first traces of the Ponte Vecchio come from Roman times, when the bridge was built out of wood and stone. The bridge was destroyed many times, whether by the frequent flooding of the river or an attack of barbarians. But each time that it was destroyed, the bridge was subsequently rebuilt. As told by Giovanni Villani in his book Nuova Cronica, the bridge was always reconstructed on two great pilasters that we can still see today supporting the current structure. The modern appearance of the Ponte Vecchio has its roots in the Medieval age - when in the year 1345, after yet another flood, a mysterious hand planned the structure. We don't really know with certainty who this mysterious architect was that designed the new form of the Ponte Vecchio: the only one to this day still capable of withstanding the strength of the Arno. The only trace is a phrase sculpted above a stone on the bridge which reads: "In the thirty-third year following thirteen hundred, the bridge fell, from a watery flood: ten years later, at the pleasure of the Commune, it was rebuilt, with this adornment." The art historian Giorgio Vasari (who lived in the 16th century) claimed that it was Giotto's greatest student who built the bridge: Taddeo Gaddi. But there is no evidence to back this up. Others instead say that it was built by Neri di Fioravanti. But this too lacks definitive proof. Some modern scholars think that it was actually Fra Giovanni da Campi, a Dominican friar of Santa Maria Novella, who designed the bridge. The low and wide arches that support the bridge are reminiscent of the architectural style of the Dominican friars: the first in the world to define themselves as "architects." The Dominicans would have utilized the principles of Platonic number theory and Pythagorean Mysticism to create a structure that was capable of maintaining a "harmonious relationship" capable of withstanding the full destructive force of the Arno river. In the middle ages this magnificent bridge was thus constructed. But above and beyond the threats posed by nature, the people of Florence also needed to defend themselves against the attack of foreign invaders. In those years, the feudal people were protected by high walls built along the banks of the river. For enemies there remained no other possibility than to try and enter the city by crossing the river and then climbing the bridges that were left unprotected by the walls. In order to defend the Ponte Vecchio, fortified walls were constructed (where today one finds the shops). Meanwhile at its four corners four guard towers were built. Today these towers no longer exist. Except for one: La Torre dei Mannelli (the Mannelli Tower). Official headquarters of Florent Apartments (if one wishes to visit, just ask). Inside the walls of the bridge were constructed over 40 shop spaces that the Government of Florence rented to merchants as a way of recuperating the funds required for the construction of the bridge itself. 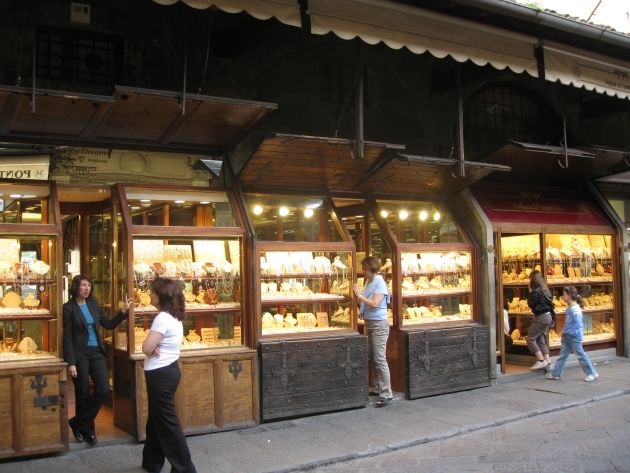 Initially, one was able to find stores selling all kinds of products on the Ponte Vecchio, but in 1442 this privilege was given as a unique concession to the Guild of Butchers. This was done for a rather grotesque reason: the waste products of the butchers were making the center of Florence dirty and foul-smelling, so the butcher stalls were relocated above the Ponte Vecchio, where they were able to throw their refuse directly into the river. It was during the 16th century that the Government actually began selling the stores to the merchants, eventually giving the Ponte Vecchio its characteristic form. It was the shopkeepers, free from legal constraints, who began to modify the structure of the bridge by eliminating the fortifications and adding windows and additional levels: under, above, and beyond the bridge. Today we are able to see these new constructions propped up by the "sporti": the big wooden beams that support the bridge and that always seem on the brink of collapse. Over time, the Ponte Vecchio became a notorious street where chaos and anarchy reigned. It was for this reason that Cosimo I de Medici, Duke of Florence, ordered the construction of the Vasari Corridor. The corridor was built in 1565 connecting the Palazzo Vecchio and the Palazzo Pitti, thus allowing the duke to cross the Arno river without entering into contact with the florentine people for fear of assassination. This situation lasted all the way until 1593, when Grand Duke Ferdinand I removed the butchers from Ponte Vecchio and replaced them with goldsmiths and silversmiths. At this time, the Ponte Vecchio assumed its characteristic form, which has been preserved through the years and which can still be admired even today. We hope you can visit this beautiful symbol of Florence during your holiday.